The Senate voted 14 -5 Friday to approve a sweeping overhaul of Alaska’s criminal justice system. The action sends the bill to Gov. Bill Walker’s desk. Senate Bill 91 would allow some low-risk nonviolent offenders to avoid jail time. It also would establish a new pretrial services program with a goal of reducing recidivism. And it would allow those in treatment programs to receive credit for time served instead of imprisonment. 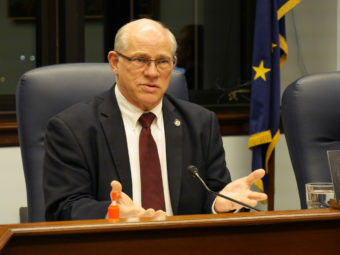 Bill sponsor Sen. John Coghill, R-North Pole, said the bill was driven by a consensus among members of the Alaska Criminal Justice Commission. He also said it draws on social science research. And Coghill said legislators will continue to make changes to the system. Walker says he’s eager to review the bill.